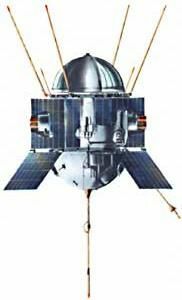 Ukrainian earth magnetosphere satellite. Studied charged particle flows. Science satellite built by Yuzhnoye, Russia. Launched 1966 - 1968. Used DS Bus. Status: Operational 1966. First Launch: 1966-12-21. Last Launch: 1968-04-26. Number: 2 . Gross mass: 300 kg (660 lb). Family: Earth, Magnetosphere sat. Country: Ukraine. Launch Vehicles: Kosmos 2, R-12, Kosmos 63S1, Kosmos 11K63. Launch Sites: Kapustin Yar, Kapustin Yar LC86/1, Kapustin Yar LC86/4. Agency: MO, Yuzhnoye. Bibliography: 2, 6, 99, 12274. 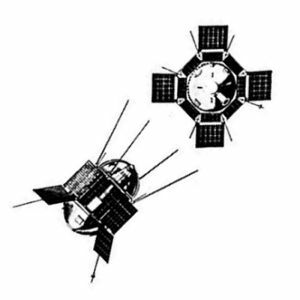 Other satellites in the DS-U2 series had a similar appearance. 1966 December 21 - . 13:12 GMT - . Launch Site: Kapustin Yar. Launch Complex: Kapustin Yar LC86/1. LV Family: R-12. Launch Vehicle: Kosmos 63S1. Cosmos 137 - . Payload: DS-U2-D s/n 1. Mass: 295 kg (650 lb). Nation: Russia. Agency: MO. Program: DS. Class: Earth. 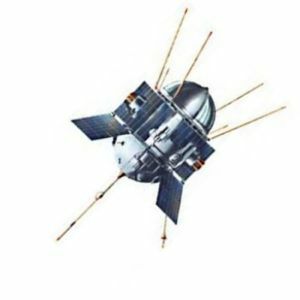 Type: Magnetosphere satellite. Spacecraft Bus: DS. Spacecraft: DS-U2-D. Completed Operations Date: 1969-05-12 . Decay Date: 1967-11-23 . USAF Sat Cat: 2627 . COSPAR: 1966-117A. Apogee: 1,718 km (1,067 mi). Perigee: 219 km (136 mi). Inclination: 48.80 deg. Period: 104.40 min. Studied charged particle flows..
1968 April 26 - . 04:42 GMT - . Launch Site: Kapustin Yar. Launch Complex: Kapustin Yar LC86/4. LV Family: R-12. Launch Vehicle: Kosmos 11K63. Cosmos 219 - . Payload: DS-U2-D s/n 2. Mass: 300 kg (660 lb). Nation: Russia. Agency: MO. Program: DS. Class: Earth. Type: Magnetosphere satellite. Spacecraft Bus: DS. Spacecraft: DS-U2-D. Decay Date: 1969-03-02 . USAF Sat Cat: 3220 . COSPAR: 1968-038A. Apogee: 1,745 km (1,084 mi). Perigee: 215 km (133 mi). Inclination: 48.40 deg. Period: 104.60 min. Studied charged particle flows..